Fort Knox is located in Kentucky, between Elizabethtown and Louisville. The base is home to the Army Human Resources Center of Excellence including the Army Human Resources Command, US Army Cadet Command and the US Army Accessions Command. 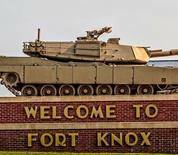 Units that are currently stationed at Fort Knox include the 3rd Brigade Combat Team 1st Infantry Division, the 3rd Sustainment Command, the 19th Engineer Battalion, the 4th Cavalry Brigade First Army Division East, the 95th Training Division, the 113th Band and the 84th Training Command. The General George Patton Museum, showcasing the history of the US Army's Calvary and Armored Forces and General George S. Patton's career, can be found on Fort Knox. A bullion depository of the US Department of the Treasury is also located on base. This Fort Knox directory features the critical info you’ll need to navigate through the many facilities and recreational opportunities available on base.